In the spring of 1973, the Maple Leafs missed the playoffs again after exiting in the first round the previous 2 seasons. In the off-season, Jim Gregory and his staff would make personnel choices that would have impact in building the Leaf team that peaked with a Semifinals appearance in 1978, and would unfortunately be dismantled quickly thereafter. Making a big splash in 1973, Jim Gregory was able to give the Leafs 3 selections in the top 16. In March he traded his top goalie in Plante to get Boston’s #15 pick and goalie Ed Johnston, a Cup-winner with the Bruins. Bernie Parent was ready to return to the NHL, but not Toronto, so at the draft Gregory sent Parent back to Philly, getting Favell and Brossart, plus Philly’s #10 pick. With these moves, plus the #4 pick, Gregory was able to turn an aging goalie and another who has no interest in playing with his club, into his #1 right wing, #2 defenceman, plus replace his tandem in net and get a couple more pieces. In terms of what Gregory was giving up, Boston received the least. Plante played 8 games before taking a year off, and then joining the WHA. Doug Gibson played 63 NHL games. He spent 7 seasons in the AHL and later 4 in Europe. Philadelphia got significantly more. Larry Goodenough played 6 NHL seasons, 242 games in total, and was a Stanley Cup winner with the Flyers. Of course the main piece was Bernie Parent, who would backstop 2 Flyer championships, and win both the Conn Smythe and Vezina trophies in 1974 and 1975. The Leafs were able to add 2 significant pieces to their team. Future Hall of Famer Lanny McDonald quickly grew into a star for the Leafs, tallying 93 points in his 3rd season. McDonald posted 3 consecutive 40+ goal seasons, and 4 consecutive 85+ points. His famous goal in the 1978 Quarterfinals Game 7 overtime to eliminate the Islanders is among the top Leaf moments. He was not only a scorer but a gritty winger who easily handled first-line duties. He assisted on Sittler’s Canada Cup winner, and the 2 were good friends. By the late 1970s, McDonald and Sittler, along with Dave ‘Tiger’ Williams, formed one of the NHL’s best lines. Lanny and Sit appeared a combined 6 times in top-10 NHL goal scoring, and 7 times in the top-10 points while in Toronto, while Williams was a perennial leader in penalty minutes (then a major NHL statistic). Ian Turnbull also played well, managing 35 points his rookie season, Though he missed much of 1974-75 with an injury, he returned to post 4 consecutive 55+ point seasons. He played over 500 Leaf games, and had 2 20-goal seasons. He still holds the NHL record for scoring 5 goals as a defenceman in a single game against the Red Wings in 1978. Along with 1973 free agent Borje Salming, the Leafs had a pair of defencemen who could hit and post points. Verdict: The 1973 draft represented a major step for Toronto in team building. Available to the Leafs but not selected included John Davidson, Andre Savard, Blaine Stoughton, Bob Gainey, and Rick Middleton. However, of the 3 Leafs selected, Neely played the fewest at 283 games, while Turnbull played over 500 and McDonald over 1100. Johnston played a single season before being sent to St Louis for Gary Sabourin. Sabourin was traded after one year for Stan Weir, who had a 50 point season as a second line forward, but overall was a disappointment. He left via free agency for Edmonton of the WHA. Brossart was included with Tim Ecclestone in a trade that brought Rod Seiling back to Toronto. Seiling, a Leaf property that had been traded in 1964 in the deal for Andy Bathgate, played 137 Leaf games as a defenceman, tallying 36 points and going +12. He left via free agency for St. Louis. Favell was sent to Colorado for cash in 1976. Neely was sent to Colorado, but returned to the Leafs in cash deals. He would be sent to the minors and retire in 1980. 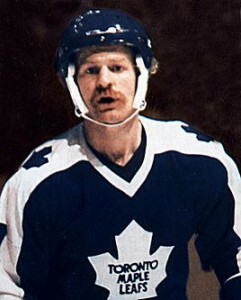 Lanny McDonald was given away in a trade that resulted as part of the feud Ballard and Imlach waged against Sittler. Along with young defenceman Joel Quenneville, McDonald was traded for Pat Hickey and Wilf Paiement. Though both performed well, neither Hickey nor Paiement could ever match what McDonald and Quenneville could have contributed, not to mention the damage done to the Leafs as a team. One of the worst trades in franchise history, it marked for many the decline of the franchise to the bottom of the standings through the 1980s. Turnbull was traded in 1981 to Los Angeles in return for John Gibson and Billy Harris. In the end, Paiement was the best of the returns, posting a 97 point season. But ultimately, none of Hickey, Paiement, Gibson or Harris played more than 200 games or had 200 points in a Leaf uniform. Hickey, Gibson and Harris were soon let go from Toronto, in return for cash or draft picks, none of whom played in the NHL. Paiement was traded in a deal the yielded Miroslav Frycer. Frycer played a little over 300 Leaf games, and had 3 seasons where he scored over 25 goals. He was eventually traded for Darren Veitch, who played a limited role in Toronto before being traded for Keith Osborne (0 Leaf games, eventually lost to Tampa in the expansion draft).